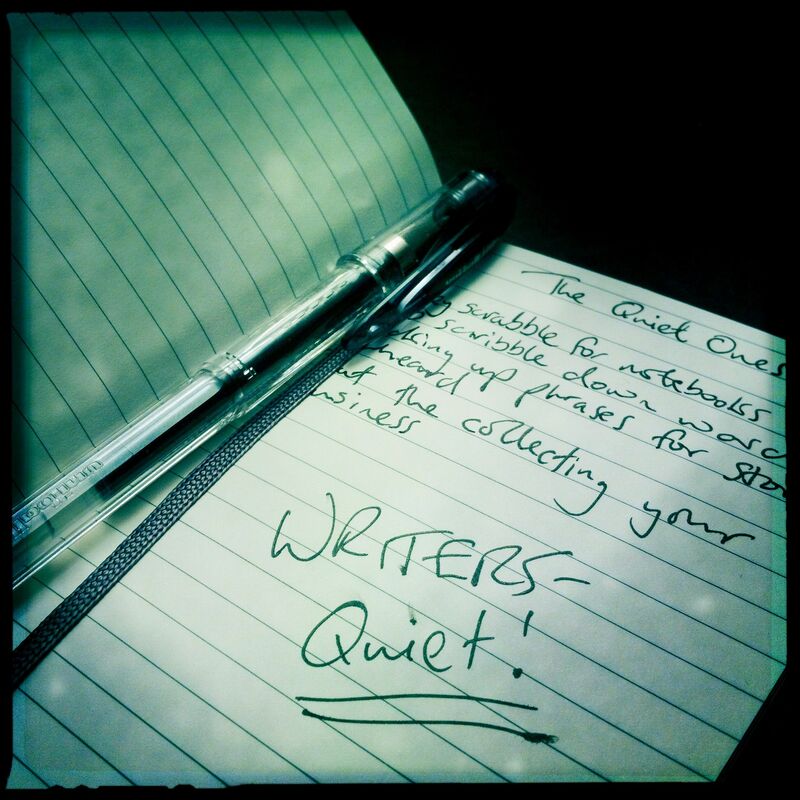 Writers – It’s always the quiet ones! As a writer we need to have the ability to disappear in to the background. To observe. To extract meaning from body language, action and reaction. To study human relationships. To unearth great dialogue. To ask the ‘what-if’ questions and let our imaginations run free. All in the pursuit of the story. Which means, we need to know when to shut up and listen to let our senses do the work. That’s not to say we’re all shrinking violets, too introvert to go out in to the world – far from it. But most of us have a natural tendency to just hang back a little, take in the scene and happily fulfill our roles as ‘The Quiet Ones’. What do you think? Do you find it easy to fade in to the periphery and enjoy watching the world go by? Are you secretly one of ‘The Quiet Ones’? To help you decide, have a read of this short poem I wrote. They scrabble for note books to scribble down words. Picking up phrases for stories unheard. To tell some more lies. They dine on depravity, reality interred. You think you catch whispers and glances then gone. And right where they belong. ← P is for Pigeon-Hole! Stop trying to put me in a box! Ahh, of course.. that explains why I didn’t start writing till in my 50’s (yes, old wise one..), took me a while to learn not to be so full on and shut up occassionally..
Haha – I’m sure you were writing before that too, Lynne – you just didn’t realise it. Call it research. 🙂 I chose this word too. For me, it’s a rare treasure. But when it finally comes, I can’t imagine anything better. Very true, Tonja. Thanks for stopping by. I look forward to taking a look at your stuff too. That is a very lovely poem! It captures the essence of a writer, exactly! Thanks Dee! Yes, I think we all do that to a certain extent. Memories can be very powerful things. Oh yes – I’ve seen your mug on one of your posts – so true. I get a kick out of putting real people in my stuff and I also have a thing about names. I love to find interesting or funny names. Hello, Kelly! I like to listen and observe, but I like talking and asking questions, too. I just don’t like talking about myself! I like hearing what other people have to say. There’s always a good story idea just waiting to be discovered if you open your eyes, mind, ears, and close your mouth. Hi Laura – yes, my teacher always used to say “You have 2 ears and one mouth – use them in that order!” Thanks for reading and commenting. I’ll be sure to swing by to see what you have been up to. Love the poem. I’d say I’m one of the quiet ones, though most of my story ideas come from my head, not from people watching. My imagination seems far more fertile than the people around me. I tend to like my friends calm too, LOL. Oh yes, the imagination goes without saying, Rinelle! If we don’t have that, we don’t have anything. Great poem. I am very quiet in new company and many people have always thought I was like that all the time,I’m not.